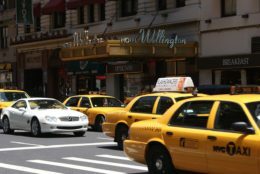 Taxis and divorce – on the surface they wouldn’t seem to have a lot in common, but as we here at DivorceHotel have had that comparison made several times recently (BBC World Service, New York Observer) it’s interesting to explore some similarities! I expect, like me, you have experienced flying into a far away country only to be met at the airport by a horde of expectant taxi drivers keen to take you to your hotel for what they assure you is a ‘good price’. I also expect that, like me, you have sat in the back of that taxi with a growing awareness that you are being fleeced by a driver who knows full well that he is, in more ways than one, taking you for a ride. Here at DivorceHotel, as with an Uber ride, you know exactly how much the process is going to cost (a lot less than you might previously have imagined). You know how long the journey is going to take (we guarantee a completion date with you from the outset). Like Uber, we are efficient and effective – the comparison between us, whilst unexpected when we first heard it, is a good one. Uber has been, like DivorceHotel, a service which has ‘shaken up’ the old ways of doing things. For far too long the divorce world has been a stagnant, tired, traditional world where (a lot of, but not all) lawyers milk clients for hefty fees, where the process drags on for months and months (if not years) and, as a consequence, couples become increasingly antagonistic towards each other. As at Uber, we have successfully challenged the status quo – we provide a radical new approach which focuses on affordable, non-acrimonious resolution within just 2 days. Yes, you read that right, just two days. We really are shaking the dust off the old way of doing things! To finish, maybe there is only one difference between our two organisations – a lot of folks use Uber daily, maybe you will only need to use DivorceHotel just the once – but you will give us a 5 star rating and you will definitely want to tell your separating contacts about us so that they, like you, can benefit from our service. DivorceHotel – kind of proud to have been dubbed the ‘Uber of Divorce’! Do you also have questions about your divorce? Feel free to contact me any time or register for the DivorceHotel free consultation!